So it seems like for the past three or so years I've reached the end of the year to discover I haven't covered as much black metal as I'd like to, and in 2016 I was relatively enthused to discover that the 90s atmospheric black metal group In The Woods... had reformed with a new vocalist and a new album Pure that year. I was a little bit less enthused to discover while listening to the album that Pure wasn't exactly a straightforward black metal album by any stretch. If anything it felt like a bait-and-switch - I remembered the huge melodic swells of Omnio and I had high expectations... only to get a project that was just as melodic, but also way more contemplative, clean, and owing more to both progressive metal and doom metal along the way. And here's the thing: in comparison to a lot of fan response I'd seen, I was a lot more positive on it than most, as I thought the writing put in a lot of heavy lifting and the melodies were as strong as ever - even as somebody who isn't really into doom metal or its offshoots, In The Woods... clicked for me. So fast forward to now, I still have the feeling I haven't covered enough black metal, and out of nowhere I discovered In The Woods... was putting out another project! Seriously, I put this on the schedule myself, and I was excited for this: from the track listing it seemed more streamlined, reportedly they had increased the tempos and brought back more of the black metal elements with even some death metal touches... yeah, I had every reason to believe this could be great, so what did we get from Cease The Day? Okay, here's a classic example of someone like myself who might have stepped up to a project with inflated expectations because I didn't do enough full research into what I was likely to get with the album. Because going into Cease The Day, I had no reason to believe that this record might feel compromised in any way... only to discover about five listens of feeling underwhelmed that I was dealing with a different In The Woods... lineup that highlights just how important the right alchemical balance can be. 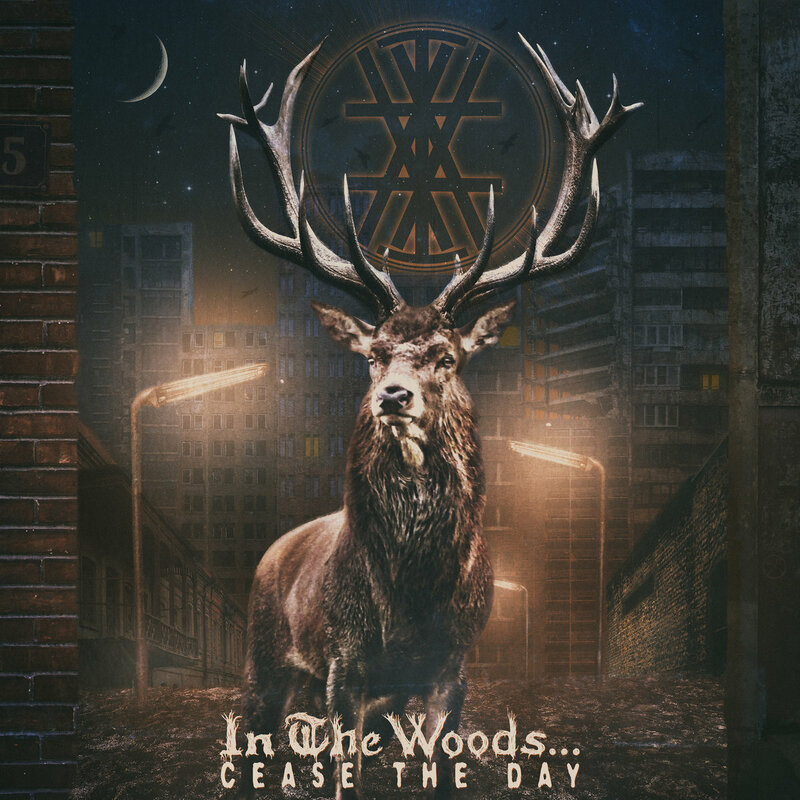 So yeah, if you're going in expecting an In The Woods... album that's the match or better of Pure, you're going to wind up disappointed, because while this isn't bad, it's certainly a grade weaker than you might expect and a considerable step from greatness. And for once, it's pretty damn easy to pinpoint the cause: the founding guitarist and the bassist, the Botteri brothers, both left the group, leaving drummer Anders Kobo as the only remaining founding member and thus requiring the gaps to be plugged in by session players... and in theory, this isn't on its face a bad choice, especially if said players can step up and deliver beyond a supplementary role. But that requires the mix balance placed in a way to draw emphasis where it's needed, and one of the hidden strengths behind an album like Pure was the groove section - most of which seems to have gone mostly out the window for Cease The Day. Sure, you might hear the bass on occasion, but whether it's called upon to do anything with heft or presence beyond assist drum patterns that seem to wind up feeling less progressive or interesting than you'd hope, it's a faint hope at best. And what's exasperating is that at least on the surface you can tell that In The Woods... were seeking to amp up a greater focus on the guitar-driven melodies, which split the difference between thicker, doom metal crunch, a blur of black metal tremolo picking, and even some shred that recalls faint hints of thrash or progressive metal, and that's before you tack on the acoustic passages of 'Respect My Solitude' or the piano accents of 'Cloud Seeder', and nobody can say that In The Woods... aren't a tuneful band at the very least. But when you compromise so much of your melodic grooves to get to this point, you wind up with an oddly muffled lower end where the kickdrums sound thinner than they should - especially if you're trying for anything close to doom - and the heavier riffs can lack impact. That's not saying you won't hear a bassline - in fact, you can hear a fair amount of bass at least in the opening passages of most of these songs - but it's not like it's got much definition or texture or tempo and it rarely lasts - and I can't stress how much this feels like a misstep, especially those rougher black metal passages complete with the first screamed vocals In The Woods... has used in years could benefit from some pulsating foundation. And again, what's frustrating is that there are some solid melodic passages here, especially with James Fogarty bringing his multi-tracked clean baritone to bear across the entire project, and he's got a convincing enough scream to break it up well - although they occasionally tack on these hollow, oily layers like across chunks of 'Empty Streets', a song that had enough murky smolder to not really need them. And while I'm harping on production gimmickry, I'll say I wasn't really a fan of the crowd noise integration into 'Transcending Yesterdays' - yes, I get why it's there in order to highlight a very new incarnation of In The Woods..., but it doesn't really fit the haunted, meditative vibe through some of the slower tempos and folk touches, a stab at an anthem that feels out of place for this band. But yeah, I really love the main melodic passage at the core of 'Respect My Solitude' and the elegant balance of 'Cloud Seeder', and for the most part I like the acoustic guitar elements adding texture to the main melody line - although they can feel a little stilted opening 'Strike Up The Dawn' and I kept thinking that song really needed a solo given any sort of emphasis instead of getting nearly drowned out by the rhythm guitars' tremolo riffing, which also happened on 'Transcending Yesterdays'. And for the life of me I'm not sure why they did this, which comes to a weird dichotomy with the song structures of this album and how progressive they really seem to be. On the one hand, I respect that In The Woods... have a focus on melody and can write a solid hook, but they might not feel the need to hammer those hooks so heavily if they let their solos or more progressive elements have some presence in the mix. Hell, it might be the most openly folk passage on the album, but I liked when In The Woods... doubled up the multi-tracking, brought the piano to the forefront, and ended the album with the title track - hell, if they had bothered to give it more than two minutes, I'd call it a highlight, which makes me wonder why some songs got extended passages that aren't really interesting enough to earn their keep while this was an abbreviated coda. ...which might as well be my tagline for this album. Look, I don't think this is a bad album - in a lot of ways it is quite good, with solid melodies, an increased black metal focus, and production that does at least try to pick up some dramatic swell. But without a stronger foundation in the content or grooves, Cease The Day just doesn't have as much distinctive impact as I was hoping, and the unbalanced song structures don't really help. As such, I'm giving this a very light 7/10 and a recommendation for fans, but as much as In The Woods... want to leave behind their past, the dawn they're trying to call still places them in that shadow.